Explanation: Bright blue stars are still forming in the red pillars of the Eagle Nebula. Made famous by a picture from the Hubble Space Telescope in 1995, the Eagle Nebula shows the dramatic process of star formation. 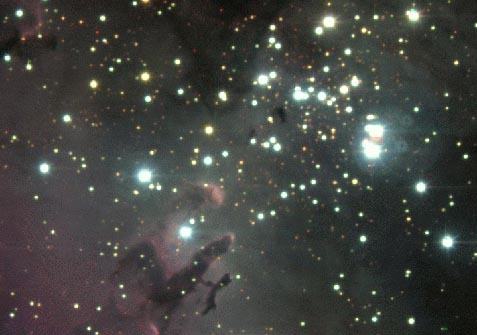 To the upper right of the nebula in the above picture lies the heart of the open cluster M16. This picture closely depicts the true colors of the stars and nebula. The bright blue stars of M16 are continually forming from the Eagle Nebula gas, most recently in the famous gas and dust pillars seen below the photo's center. Of all the young stars in M16, the most massive shine the brightest and the bluest. A typical age for a star in this cluster is about 5 million years, making them only 1/1000 the age of our Sun. Light takes about 7000 years to reach us from M16.